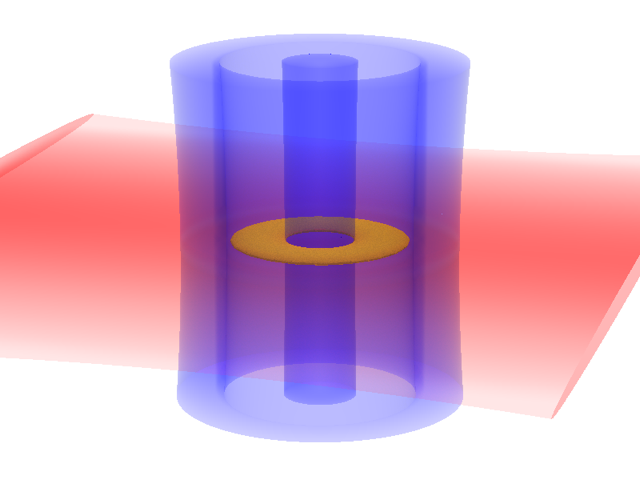 Schematic of laser setup (red and blue beams) to create flat, toroidal-shaped BEC (shown in yellow), courtesy of authors. 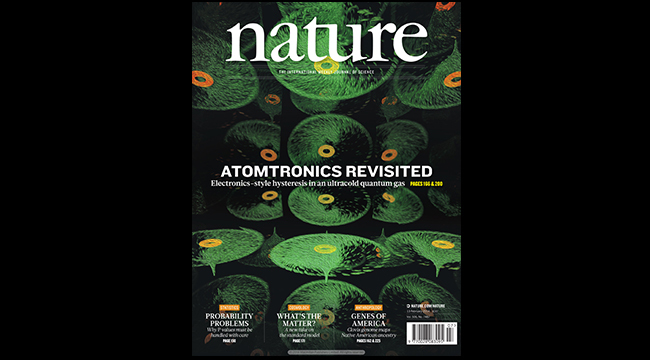 Atomtronics is an emerging technology whereby physicists use ensembles of atoms to build analogs to electronic circuit elements. Using a superfluid atomtronic circuit, PFC supported physicists have demonstrated a tool that is critical to electronics: hysteresis. This is the first time that hysteresis has been observed in an ultracold atomic gas. In many electrical systems hysteresis is programmed into the electronic circuit. Here, physicists observed hysteresis that is a natural property of a quantum fluid. The fluid made from ultracold atoms and resides in a doughnut-shaped trap that is only marginally bigger than a human red blood cell. Physicists use a focused laser beam to stir the quantum fluid, yet the fluid does not speed up continuously around the ring. At a critical stir-rate the fluid jumps from having no-rotation to rotating at a fixed velocity. In this research paper, the team explored what happens when they try to stop the rotation, or reverse the system back to its initial velocity state. Without hysteresis, they could achieve this by reducing the stir-rate back below the critical value causing the rotation to cease. In fact, they observe that they have to go far below the critical stir-rate, and in some cases reverse the direction of stirring, to see the fluid return to the lower quantum velocity state. Controlling hysteresis opens up new possibilities for building a practical atomtronic device. For instance, there are specialized superconducting electronic circuits that are precisely controlled by magnetic fields and in turn, small magnetic fields affect the behavior of the circuit itself. Thus, these devices, called SQuIDs (superconducting quantum interference devices), are used as magnetic field sensors. This system is an atomtronic version of a SQuID where rotation is precisely controlled. In this case, the atom SQuID could be used as an inertial sensor. Atomtronicsis a young technology and physicists are still trying to understand these systems and their potential, including the possibility of using the two-velocity state system as a novel qubit.